Drive out past the airport as far as you can toward Valdez Glacier Pond. The road is usually plowed to the gun range; park wherever the plowed section of road ends, approximately marked by the green X below. The first couple of miles going up Camicia Creek are exposed to continuous slide paths. Don't ascend when there is new snow or any chance of sun induced slides. There are a couple of narrow sections with open water that vary from season to season. Continue southish. Your objective is now in view, pictured in the sun below. Note the bergschrund guarding the bottom of the line. Note the crevasses on looker's right. As always, note that you should be making safety related decisions, and there are numerous ways to get yourself maimed or killed on the way up and down throughout this route. The shot below was taken on a tour I did in 2012. 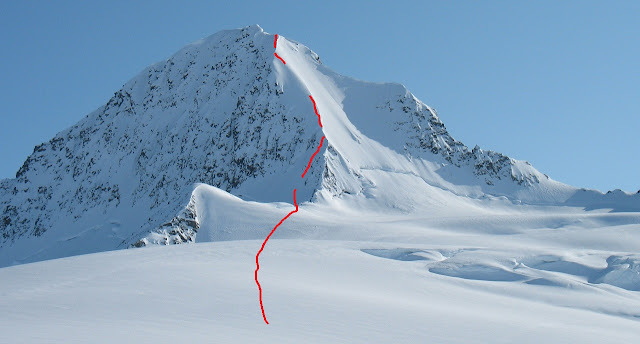 You avoid the bergschrund on your way up by going over the ridge, back up to the ridge, and continuing to boot as shown by the red line above. You're skiing down the triangular face that is mostly in the sun. Make sure and carry enough speed to get over the bergschrund, which you no doubt wisely scouted from below. The summit is another 50' vertical or so from the top of the ski line, and it is a sketchy exposed traverse to get to the summit from the top of the line. 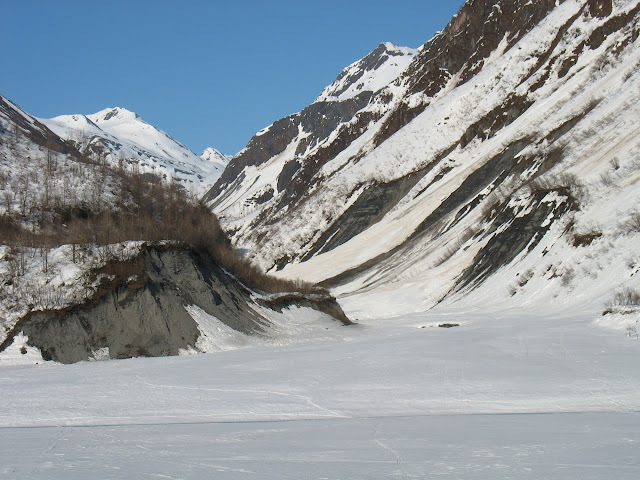 Once you're on Camicia Glacier, note plenty of other fine skiing to be had. Looking on the topo, 7193 is the highest point for miles in any direction, and that north face is pretty quality, but don't be dissuaded from exploring other fun stuff. Conditions permitting of course. Click here to return to the routes page.